Public talks about mental illness will be hosted in Cape Town during September – October 2018. 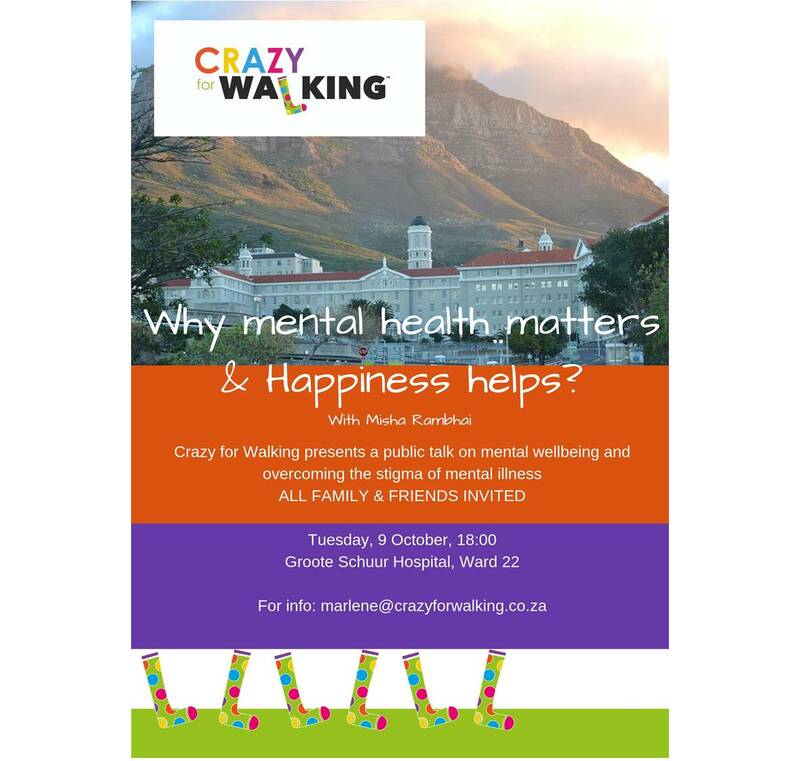 Contact Marlene van den Berg marlene@crazyforwalking.co.za or Dr Karen Olckers karen@lifepathgroup.co.za to request a presentation at your company/organization. Marlene is an Occupational Therapist, working in the field of mental health. Her specific interest is in the dynamics and processes of groups. She is a registered Enneagram practitioner, TRE specialists, Yoga teacher and is trained in Gestalt therapy. Her passion for psychiatric intervention lies in mobilising individuals through the use of activities, creative and alternative mediums to life their best lives despite a mental health diagnoses. 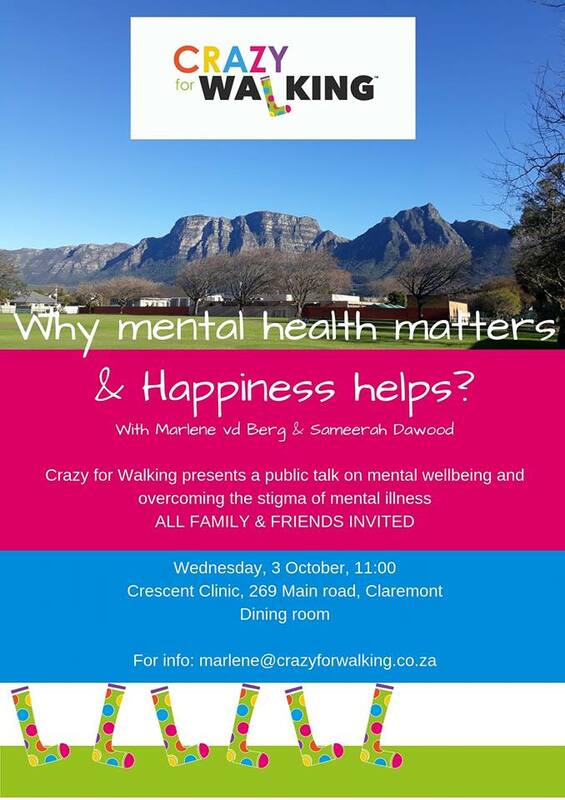 Marlene will do a presentation on “why mental health matters and Happiness HELPS on 3 October @ 11:00 at Crescent Clinic in Cape Town. Join us for a public talk on the stigma of mental illness on 2 October @ 11:00. Hosted by Tyger Valley Clinic. 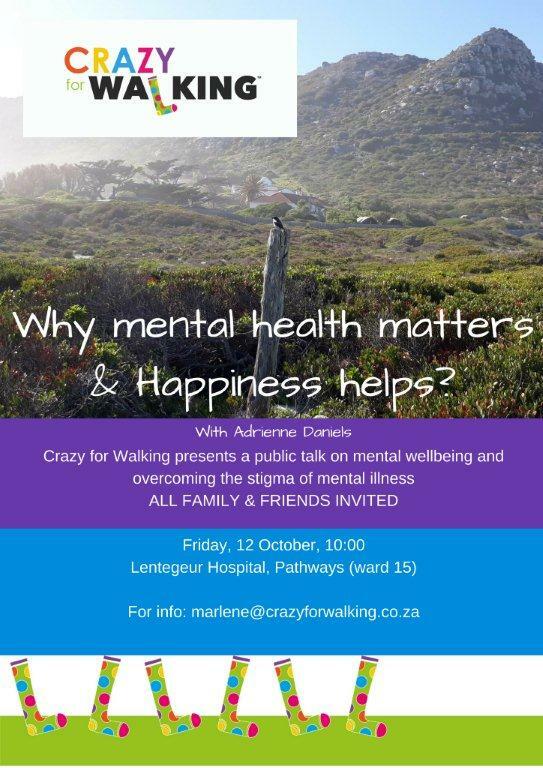 Join us for a public talk on mental health in your family at Crescent Clinic in Cape Town on 8 October @ 18:00. 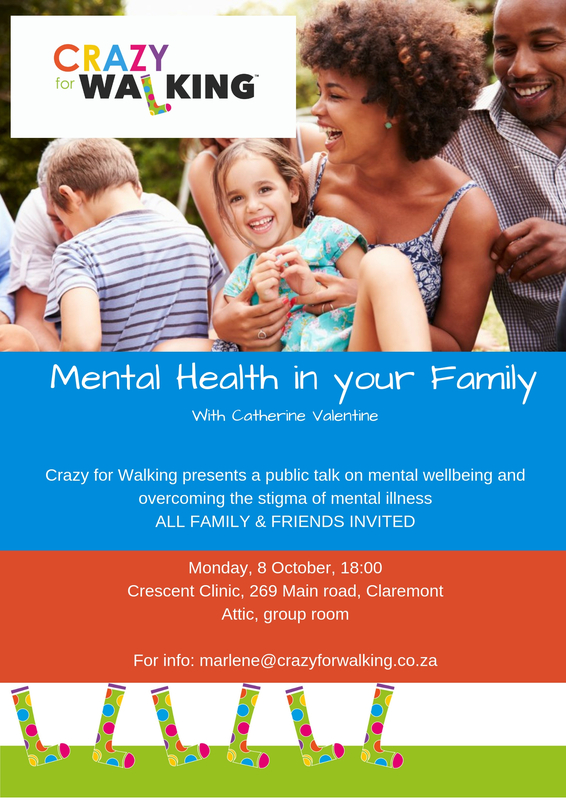 Catherine Valentine will present a talk on mental health in your family. Cath is an Occupational Therapist and Lifestyle Success Coach. She believes that recovery is not just about managing illness or disease but also an opportunity to redefine success and uncover individual strengths. She helps clients to build a lifestyle based on self awareness, self compassion, health and wellbeing practices that make life more meaningful and fulfilling.